Railpictures.ca - Jason Noe Photo: On a hot summer afternoon, the shell of retired Goderich-Exeter Railway (GEXR) GP35m 3834 and GP9 901 bask in the sun beside the former CN Goderich, Ontario station. Even in their dilapidated state, the pair are still earning their keep on GEXR, by providing usable parts to keep the rest of the GEXR four-axle motive power operating daily and earning their keep. Both units would eventually be scrapped at Goderich along with several other parts locomotives in the years that followed. | Railpictures.ca – Canadian Railway Photography – photographie ferroviaire Canadienne. 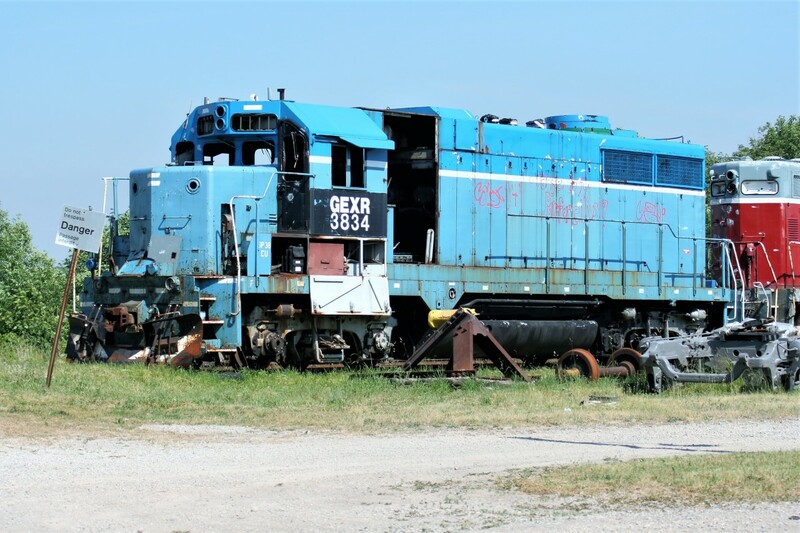 Caption: On a hot summer afternoon, the shell of retired Goderich-Exeter Railway (GEXR) GP35m 3834 and GP9 901 bask in the sun beside the former CN Goderich, Ontario station. Even in their dilapidated state, the pair are still earning their keep on GEXR, by providing usable parts to keep the rest of the GEXR four-axle motive power operating daily and earning their keep. Both units would eventually be scrapped at Goderich along with several other parts locomotives in the years that followed.